Driving Ambition – S5 and S6 pupils were involved in a series of six sessions on a range of aspects connected with driving, something some have already started and the rest are likely to begin soon. There was an input from the police; the fire service; the Red Cross; a mechanic; Gairloch’s driving instructor, Kenny Tallach and Highland Council Road Safety, the organisers of the event. It is hoped that the lessons learned from these sessions will benefit pupils in acting responsibly and safely on the road. This event served as an adjunct to our own ‘Campaign for safe teenage drivers’ that is posted to the parents of pupils coming up to seventeen and is also available on our website. Former Pupil speaks at Assembly – Kayley Carruthers left Gairloch High in May 2007. On Friday 16th March she returned as an Army NCO to talk to the staff and pupils about her experiences. Kayley showed some slides of her time in the army and gave advice for anyone considering the Forces. It was great to see her and the whole school wished her well. Like several other former pupils before her, she now awaits orders prior to leaving for a posting in Afghanistan. Pupil Success – Over the past 2 years Jordan Gorman (S2) has travelled twice weekly to Inverness and monthly to Edinburgh to train and play basketball for both the Highland Bears and the Highland Eagles. He was selected to take part in Basketball Scotland’s Future Starz programme this year. This culminated in a national camp in Stirling on Saturday 3rd March. At the end of the camp Jordan was selected to attend a further trial on Sunday 11th March in Dundee. Only 20 players across Scotland were given this invitation. After a very nerve racking and pressure filled 3-hour training session the coaches announced the names of those who had made the U14 boys Scotland Team. The coaches picked 15 boys to train regularly in Dundee and play in an international tournament in June in Edinburgh. Jordan’s hard work and dedication paid off as he is now going to represent his country. He made the team. Well-done Jordan! Basketball – The boys’ U14 basketball team continued their campaign in the Highland Regional League with two games in Dingwall on Saturday 16th March. The Inverness Bears proved too tough to beat this time, but the boys recovered in their second game against Elgin Eagles, coming from behind at half time to win 36 – 29. We have now played ten games in the league and won 5. A good team effort and you can see some of the action from both games by clicking on the team photo below. Culture Club – This week Culture Club travelled to a new venue when a small group of S6 boys accompanied Ms Gulliver to see an International Guitar Night at the Strathpeffer Pavillion. Three innovative acoustic guitarists, Lulo Reinhardt, Adrian Legg and Brian Gore entertained the audience individually, in duos and altogether in some truly amazing performances. Their countries of origin were all different and they brought with them an array of influences and genres in an exchange of musical diversity and virtuosity. S4 Trip to Edinburgh – As part of their Modern Studies and History courses, ten S4 pupils travelled to Edinburgh with Ms Somers, Ms Velt and our Modern Studies student Miss Mennie to visit the National Mining Museum and the Scottish Parliament. At Holyrood, the Modern Studies pupils took part in educational activities with a member of staff. They also met two of our MSP’s, Mike MacKenzie and Jamie Mc Grigor and had a question and answer session with them. The highlight of the visit was a visit to the debating chamber where a rather lively session of First Minister’s Question Time took place. The pupils enjoyed getting some first hand experience of work that goes on in government. The History pupils visited the National Mining Museum at the Lady Victoria Colliery some 40 minutes bus ride south of Edinburgh. They were able to see at first hand many objects they had only seen in their text books, such as Davey safety lamps and were delighted to recognize so much from their course. The simulated coalface tour was somewhat more realistic than our previous efforts to “create” a mine in the classroom – and even noisier! Cashless Catering – On the 20th March the Council began their Cashless Catering service in Gairloch High School. Training was provided in school to demonstrate the use of the machine to add money onto an account. It is the intention that anyone can also add money onto his or her account using the Internet. Meals can be charged at the tills to an account by the use of either a PIN or a Young Scot card. S2 Parents’ Evening – Tuesday 27th March 2012. Beach Clean Friday 30th March – Come along to Strath in the morning and help S1 pupils tidy up the beachfront. Study Club for S4, S5 & S6 pupils will take place at the beginning of the first week of the Easter Holiday – Mon 2nd, Tues 3rd and Wed 4th April 2012. Comenius Concert of Excellence Wed 30th May 7.30pm in the hall. Pupils who have worked and performed well during the year will be playing their best pieces for the delight of a Community Audience. So, please put this date in your diary, and come along to see what the young musicians have been up to this year. Donations will go towards the Comenius projects, both present and future. On Monday 19th March the Commission for Rural Education will visit the school. In the evening at 6.30pm there will be a public meeting in the school hall. The Commission members are gathering evidence about the provision of education in our community. They are keen to visit as a result of the relatively large number of submissions made to them from people living in this area during the recent consultation. The importance of our schools as a cornerstone for the survival and development of our remote communities. We hope that for a large turnout on Monday night. This could be a turning point for the Highlands and it would be a pity to miss the opportunity. Bible Gift – Last Friday Rev. R A Allan of Poolewe & Aultbea Free Church of Scotland (Continuing) presented a Commemorative Edition of the King James (Authorised) Bible on behalf of his congregation. The Bible was gratefully accepted on behalf of staff and pupils by the Head Girl and Boy at assembly. This gift celebrates the recent 400th anniversary of the original publication in 1611. All pupils also received a special bookmark to further note the anniversary. S1 Anti-Bullying Event – On Thursday 1st March all of S1 took part in an anti-bullying day. The purpose of the day is to make pupils aware of the impact their negative behaviour can have on others and how we all have a responsibility to look out for each other. The day was made up of watching and discussing video clips of different bullying situations and then making anti-bullying posters, banners and badges to be displayed in the school. Thanks to Mrs. Whall for organizing and running the event throughout the day. Pupil Success – Jordan Gorman has been training with the U14 Highland basketball Team and here he describes a recent trip with the team to Ireland. 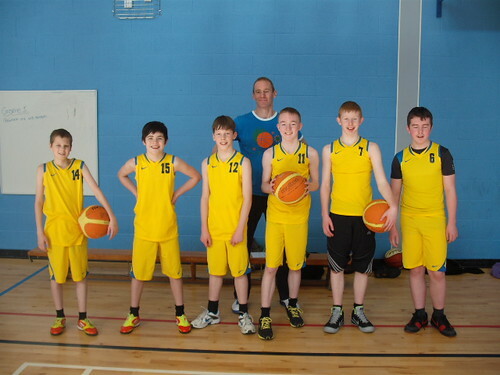 On Friday 10th January I traveled to Ireland with the Under 14 Highland Basketball team. We played in Belfast on the Saturday against Northern Ireland’s two best teams. We had played against some of the players the previous year and it was great to see them again. Later on Saturday we traveled to Dublin for two more days of playing. On Sunday we played against The Kubs, Tolka Rovers and Moycullen. These are the top three teams in Eire. We played really well and it was a great experience to play against teams from outside Scotland. It wasn’t all just Basketball. We also visited the W5 ( Science Centre) in Belfast and Dublin Zoo. This zoo is reputed to be the largest in Europe. The whole trip was a great experience. C for Craic – our new version of the school folk group, will be taking part in the Inverness Festival during the weekend of the 10th of March. We wish them well in this competition. In addition, the following weekend – March 17th – sees the group perform at Culloden Academy, as part of the Music for Youth Festival. Although not a competition, judges will be on hand to lend constructive criticism to the band. They may be invited to attend the National Festival, which takes place in Perth in June. Again, we wish them the best of luck. CULTURE CLUB: Chinese State Circus – A small group of S2 girls accompanied Ms. Gulliver to Inverness on Monday evening (27th February) to watch a performance of the Chinese State Circus. The show, called ‘Yin Yang’, kept us on the edge of our seats as we were treated to a unique extravaganza of back-flipping acrobats, defying gravity in an array of elaborate, explosive and highly choreographed presentations of power, poise and agility. Also on display was the more delicate and beautiful side of Chinese tradition with the silk aerial act, plate-balancing, parasol juggling, an eye catching Lion Dance and the amazing legendary ‘Bicycle Act’ in which 10 talented artistes manoeuvre onto a single bicycle. The evening culminated in a final act of dynamic hoop divers, performing amazing somersaults, leaps and jumps. Every sensational act flowed into sensational act without narrative and accompanied by a captivating and atmospheric all girl group of live musicians. ICT Upgrade – Over the last week the school has had a team of engineers replacing all the old PCs. All the PC computers now run Windows 7. Upgraded computers and large screen monitors have also been purchased to allow suitable computer-aided design software to operate. This upgrade provides a long overdue boost to ICT equipment. We have retained all the Apple Mac computers capable of operating OSX. Previously the printers were replaced in line with The Highland Council’s current policy. MY WORLD OF WORK – Skills Development Scotland’s new web service www.myworldofwork.co.uk continues to develop. Students, teachers and parents/carers can find articles such as Study Tips, Job Interviews, Job Hunting using Social Media and Top 10 Jobs Advertised in Scotland. There are interactive tools for building a CV, Careers A-Z, My Interview and My DNA – to help you discover what makes you tick. The My Strengths tool, now geared for school and college leavers, will allow you to highlight what might is important to you in choosing your work or study area. If you register at www.myworldofwork.co.uk, then you can save your results and activities for future use. My WoW will alert you to articles or events, tailored to particular interests. 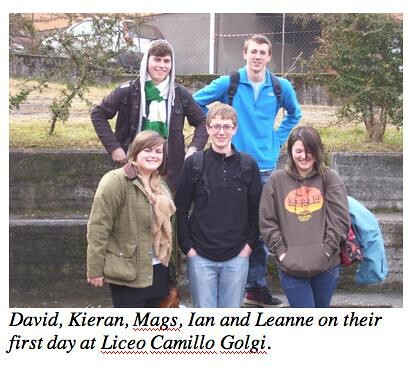 Comenius Trip to Italy – Read about this recent successful trip below. Important Dates – An Italian Evening will take place in the school on Tuesday March 20th at 7pm. The Community is invited to see photos and hear about the pupils’ recent trip to Italy as part of the Comenius Project, and also to sample some fine Italian food – entrance by donation. Rural Commission – Public meeting on Mon 19th March 6.30pm in the High School. Come along & show support for the community as well as all the local schools! Read more about the Commission here. 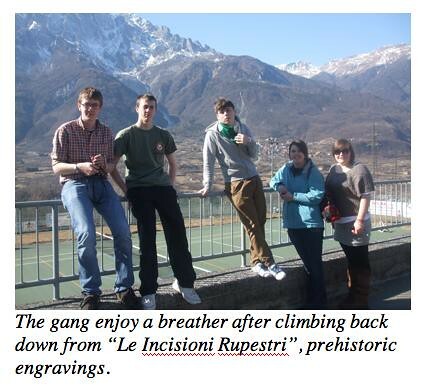 Geobus – Geology taster for pupils coming to the school on the 21st March. Sports Relief – Fri 23rd March – Sponsored 1-mile walk around the school for charity. Parents’ Evenings – S5/6 Thursday 15th March followed by S2 on Tuesday 27th March 2012. Beach Clean Fri 30th March – Come along and help S1 pupils. The Comenius Project brings together pupils from selected European schools to develop a greater understanding of other cultures by experiencing them first hand. It was the turn of our Italian partners to host the fourth of five visits by Comenius students and staff, this time from Latvia, Germany, Greece and Gairloch. The Liceo Camillo Golgi is in the small but bustling town of Breno, nestling in the spectacular Valle Camonica in the north of Lombardy. The area has been populated for thousands of years and is steeped in history from prehistoric times onwards. Although the famous resorts on the beautiful lakes Como, Garda and D’Iseo are not far away, and further north are the Tirolean Alps, Breno itself is not a tourist centre, so it was a slice of real northern Italian life for our group: David Gorman, Leanne Mackay, Mags Matheson, Kieran Morrison and Ian Paul, accompanied this time by Mrs Campbell and Ms Mackison. The north of Italy had experienced particularly wintry weather just before we arrived, so the River Oglio, which runs the length of the valley into Lake D’Iseo was partly frozen, and remained so while we were there, although the snow on the Alps receded to the topmost peaks. Once settled with their host families, our group’s schedule was packed. On Monday, after some survival Italian lessons at school, we were shown the oldest parts of the town, including the mediaeval castle. After the Carnival procession which had taken place on Sunday, the remnants of decorations and confetti were everywhere, so, colourful as the buildings already were, they were even more so for the religious festival prior to Lent. Our visit to Brescia, Lombardy’s second largest city after Milan, coincided with the return of crisp sunshine on Tuesday, so the Roman temple and forum, the mediaeval buildings and Renaissance cathedral were ready for the literally hundreds of photos the group of students took! On Wednesday, the weather was equally obliging, so after delivering our presentation of a story set in Flowerdale, based on an idea by Calum Nelson in S2, and portrayed in photos with the help of Callum MacKenzie and Connor Moore, we walked up in warm sunshine to the important archaeological site at Nadro, where ancient people engraved images of their gods and way of life on rock smoothed out by glaciation. By the middle of the week, the students had enjoyed all kinds of activities, in classes, in the games hall, and the Italian hosts had also laid on a seasonal Fancy Dress party with disco and live music. On our final school day, we visited Bergamo, where the original walled city perches on top of a hill with a commanding view of the surrounding countryside. As the temperature began to rise, we were all reluctant to leave on the Friday, to say the least, so to keep the memories alive we invite families, friends and fellow pupils to join us for an Italian Evening in the multi-purpose hall at the High School on Tuesday 20th March, where we will share our experiences, photos, and some pizza!